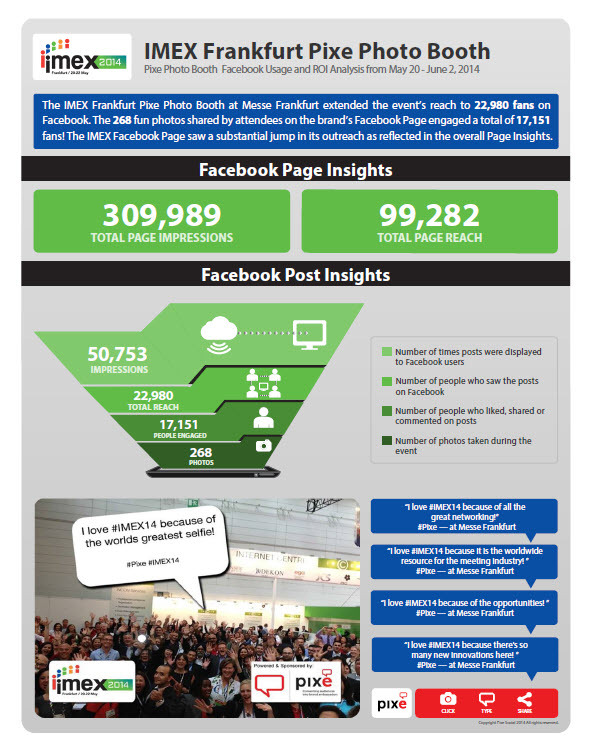 Pixe Social, the Maryland-based provider of social solutions, announces that the IMEX Frankfurt Pixe Social Photo Booth Solution has been awarded the 2014 Internet Advertising Competition’s MobileWebAward. Pixe Social’s social and attendee engagement solution was judged the winner in the Best Events Mobile Application category. IMEX Frankfurt is a globally recognized exhibition for incentive travel, meetings, and events industry influencers. Pixe Social provided a team of social contributors to walk the 2014 expo floor, taking branded pictures of attendees and exhibitors alike, inviting them to share their photos and testimonials about their show experience with fans and friends on leading social media. The photos were instantly shared on the IMEX Facebook Page live from the show floor, tweeted with the event hashtag, and streamed to a HD photo wall on the show floor. The 268 photos shared by event attendees on the brand’s Facebook Page reached a total of 22,980 online fans, generating 50,753 unique impressions. The social-sharing power of the Pixe Social Photo Booth photos also resulted in a substantial jump in the brand’s Facebook Page visibility by reaching 99,282 fans through likes and shares on Facebook. In addition to this award, Pixe Social’s consumer engagement app, Pixe Snap, was selected as the Best Social Network Mobile Application. About Pixe Social Pixe LLC, a leading technology provider, leverages user-generated content while engaging customers with brands through marketing promotions, delivers enhanced online engagement. Pixe enables businesses to secure 'photomonials' from existing customers to reach out to a phenomenally large base of potential customers on Facebook, Twitter, and Instagram, thus converting audiences into brand ambassadors.